Originated from a Gunn oscillator, the 300GHz Gaussian beam is collimated by a spherical lens and then focused by the 3D printed lens. The intensity distribution of the focused THz beam is measured with a Schottky diode mounted on X-Y-Z translation stages. As one of the leading technologies in manufacturing, 3D printing, also known as additive manufacturing (AM), is based on additive processes, in which successive layers of material are laid down under computer control. 3D printing can be used to produce jewelry, toys, tools, etc., and it has been widely employed in aerospace manufacturing and engineering design. In recent years, 3D printing has been found particularly useful in research labs due to its ability to make specialized and bespoke geometries. With the rapid development of Terahertz (THz) sources and detectors, THz waves have been applied in areas like security scanning, non-destruction inspection and communication, etc. Thus the research of optical components operating in THz range is of great importance. However, the traditional methods for THz components fabrication are complicated and time-consuming. 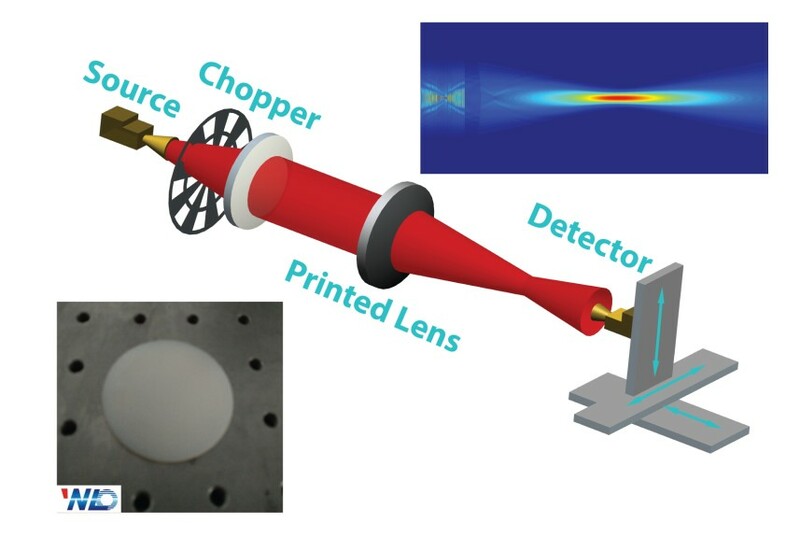 The researchers in THz photonics group from Wuhan National Laboratory for Optoelectronics, Huazhong University of Science and Technology, proposed a novel method based on 3D printing, and successfully fabricated a THz plano-convex lens from photosensitive resin. It is reported in Chinese Optics Letters, Vol.13, No.2 (2015). The measurement results of the focal property agree well with the numerical simulation, revealing that this printed lens could effectively focus THz waves. When tested with THz-TDS system, the printing material exhibits stable refractive index and low absorption coefficient in THz region. With the obvious advantage of being fast and easily fabricated on a low cost, 3D printing technology provides new insight in fabrication of more complex THz optical components. As a novel technology, 3D printing is developing very quickly, which makes it possible to realize fabrication of THz components with complex geometric features." said Prof. Jinsong Liu from this group. In the following work, researchers will further investigate the dispersion, reflection and power loss properties of the printed lens. In addition, more complicated components, such as lens arrays and Fresnel lenses will be fabricatedï¼Œwhich are useful in THz imaging system.